Our team had been using Trello for years and had only recently undergone a transition to Airtable. We were having a tough time adjusting (old habits die hard), and my Process Street colleague Ben Brandall was trying to get to the bottom of why. We love improving our productivity using everything from business process automation to focus music, and this case was no different. Trello is a powerhouse of task management but Airtable is a masterful mix of database, spreadsheet, task and project management app. How are you supposed to choose? That’s why I’m writing this post. After having used both apps personally and professionally for more than three years, I’ve been able to get to grips with who these apps are designed for and what makes them useful. Most of all, you can learn from this to see which app would suit you instead of spending years testing them out yourself. The primary difference between Trello and Airtable is their focus. Trello is designed to help you manage tasks in a simple but effective Kanban view. Airtable is capable of storing huge amounts of data as a database, then creating dynamic views to let you sort everything from basic data to complex tasks with custom filters and parameters. Trello is a claw hammer. Airtable is the whole toolbox. That doesn’t mean we’re done with the comparison, as Airtable’s wider applications aren’t inherently good or bad. It all depends on the context you approach it from and what role you need it to perform. 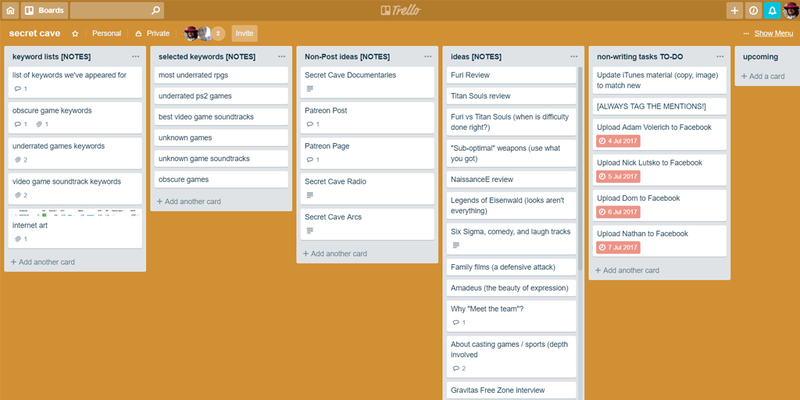 Trello is a fantastic tool that’s simple to use and great for its specific purpose. Airtable lets you do much more but it’ll take time to learn each of its components effectively, and can be a little overwhelming for those unfamiliar with it. First let’s take a look at the platforms they are available on. While there aren’t any differences between the two apps’ availability, it’s useful to know that they’re both available native to almost every platform. Plus, it’s always useful to have a bullet-point comparison in an Airtable vs Trello comparison. The only platform these apps aren’t available on is Linux, which isn’t too much of an issue considering that the web-based version of both are fully functional and easy to use (if you know how to use the app). From experience, however, Trello’s mobile apps are a little easier to navigate than Airtable due to the tighter focus and fewer features. As mentioned in the focus section of this post, Trello is much more limited in its features than Airtable. Again, this isn’t a bad thing due to the more focused nature of the app, and it’s a boon in terms of how easy it is to pick up but it’s worth reinforcing. Airtable is designed to be a database, spreadsheet, and project management app combined. The core is formed of a spreadsheet-style database which can store entries for anything you want. Once you have some data to work with, you can link data entries together and arrange them into views from grids to galleries, and calendars to Kanban boards. These views can then be sorted by any variables you’ve defined and filtered to remove unnecessary information. Imagine a spreadsheet that let you link your data together to create smart views that you can customize to show almost anything you want. That’s Airtable in a nutshell. Trello, meanwhile, is wholly dedicated to being a Kanban board in which you can create “cards” to move between various columns. While it might seem the lesser, Trello’s simple (compared to Airtable) nature is much less imposing and confusing, letting anyone immediately see what they need to with almost no training. Both Trello and Airtable allow you to collaborate with your team by assigning them to specific tasks and pieces of data, controlling their permission levels, and tracking their activity through things like comment logs on your tasks. The sheer variety of features is too much to dive into without some idea of what they add up to in the full app, hence the simplified overview above. However, we’d be doing Airtable and Trello a disservice to ignore their specific differences. So, courtesy of GetApp‘s list-based comparison, the full rundown of each app’s features can be seen below. Being a database, Airtable naturally has the ability to more readily integrate with other services but that doesn’t mean Trello leaves its users high and dry. Airtable has built-in integrations with services including Google Drive, Dropbox, Evernote, MailChimp, Slack, social media platforms (Facebook, Twitter, etc) and even Trello. It also has an API which allows you to create your own integrations, and can link to 1,000+ other apps via Zapier. Trello, meanwhile, has a more limited (but nonetheless powerful) integration library. Native integrations include Google Drive, JIRA and Slack, and its API allows developers to create their own integrations. It also has access to the vast library of apps that Zapier has to offer. Trello has a slight advantage in terms of its Zapier integration, as it has more Trigger (13) and Action (18) options than Airtable (2 and 2 respectively), meaning you can get more specific with the various stages and/or effects of the integration. This allows users to more easily automate their tasks and boards, creating Zaps to automate any and every repeatable action. It’s always useful to test out an app before you have to commit to a payment plan, and both Airtable and Trello allow for that with their free plans. For testing these services out and even full use by an individual or a small team, both free plans are more than enough to suit your needs. In terms of how the limitations affect the intended use of the apps though, Airtable’s is arguably more likely to become an issue as time goes by. Trello’s free plan only limits users in terms of the size of file attachments (up to 10MB), a lack of in-depth user permission options, and only one Power-Up (built-in integration) per board. The user permission levels shouldn’t be much of an issue until your team grows to a reasonable size and you feel the need to protect your more sensitive data. Even then, there’s always the option of creating a separate board for each team and giving people permission to those boards as needed. It’s more cumbersome in terms of syncing tasks but even that can be negated by using Zapier integrations. The Power-Ups are useful but Zapier allows you to circumvent the need for built-in integration. In fact, the most stringent limitation is probably the file size limit, as you can’t upload anything of a reasonable size with a 10MB limit. Airtable, while having a perfectly serviceable free plan, will quickly reach its limit if you’re using it as it’s intended. 1,200 records is a lot for individual and even small-scale team usage, but this puts a definitive cap on how long you can use Airtable for before you’ll have to upgrade or start an entirely new base and (essentially) archive your old data entirely. Again, Airtable’s free plan is good and perfect for testing the app out. However, if you’re a sizable team or you’re looking for a long-term solution for managing your data, tasks, and projects, bear in mind that you’ll have to upgrade to the paid plan sooner or later. Airtable and Trello have similar pricing plans in terms of the amount and method of billing (per user per month, with a discount for paying annually). The key difference is that Trello focuses on expanding user permission options, built-in integrations and file attachment sizes in its paid plan. 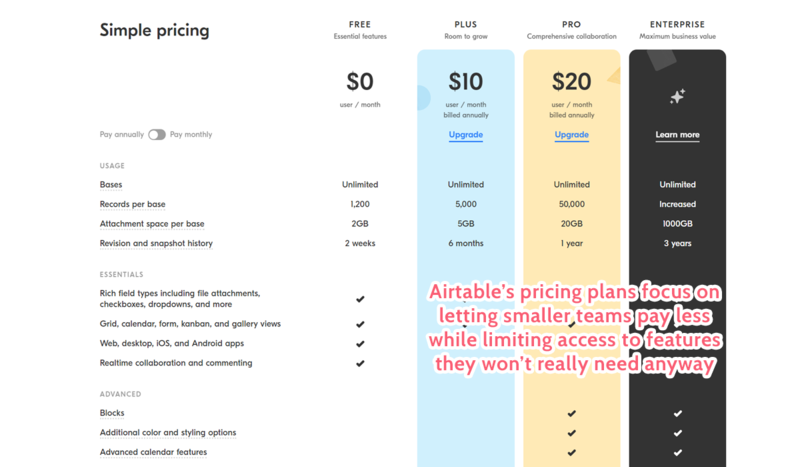 Airtable instead starts by expanding the limitations of the free plan and only brings extra features and customization into the higher paid plans. Includes: Everything from the free plan, up to 5,000 records per base, 5GB attachment space per base, and 6-month revision and snapshot history. Includes: Everything from Plus, up to 50,000 records per base, 20GB attachment space per base, 1 year revision and snapshot history, access to blocks (modular apps for bases), advanced color and styling options, customisable forms, advanced calendar features, and extra permission/visibility options for your bases and views. Includes: Everything from Pro, increased number of records per base, 1,000GB attachment space per base, 3 years revision and snapshot history, dedicated customer success manager, onboarding and training, single sign-on, unlimited workspaces, a consolidated company account, an enterprise-wide admin panel, and enhanced deletion recovery. Includes: Everything from the free plan plus unlimited Power-Ups, attach files up to 250MB, full user permission management (including sharing link and board access permissions), custom board backgrounds and stickers, and priority email support. Includes: Everything from the business plan plus Single Sign-On, 2-Factor Authentication, personalized onboarding assistance, priority email and phone support, file encryption, intrusion detection, custom security review, and enhanced SLA. It’s easy to see the difference in the target audiences (and, to some degree, the intended users) of these apps in their pricing plans. While both are perfectly usable on their free plan, Trello opens all of its features (aside from some support and security services) in its cheapest paid plan. Airtable, meanwhile, steadily increases its feature list over the course of all of its plans while also extending the available storage base (for almost everything). In other words, the pricing plans are built in a way that the size of your team and extent of your needs will dictate which tool will suit you better. Trello’s tighter focus as a task management app is more suited to smaller teams, and this is reflected in its pricing plans. 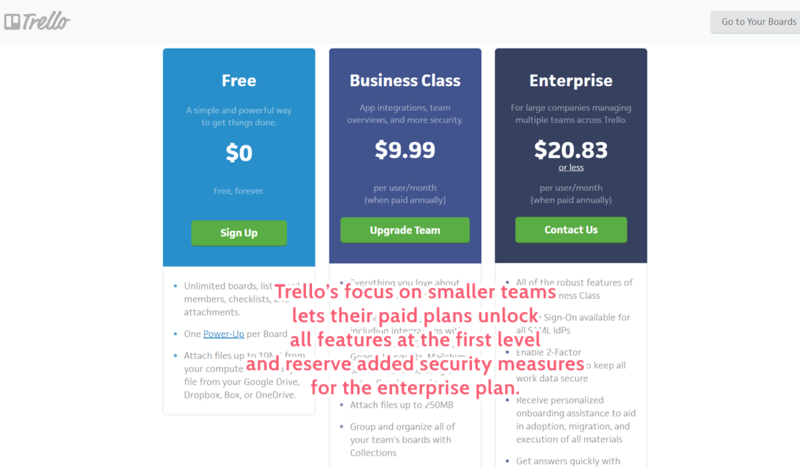 Most of the value of Trello comes with its free plan and $10/user/month paid plan, reserving mostly the extra security a larger team would need for the more expensive plans. 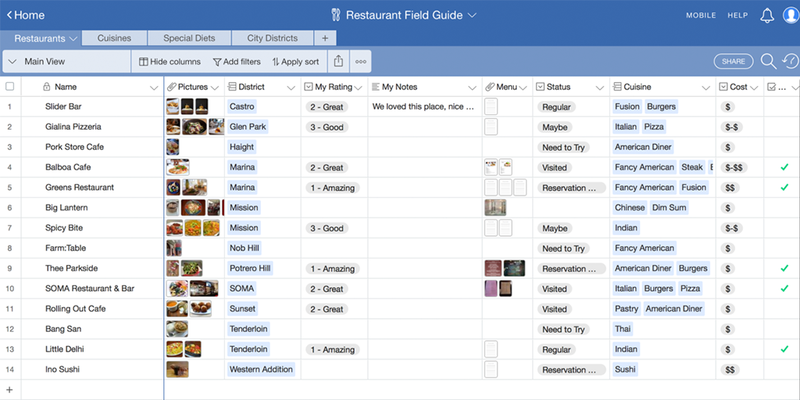 Airtable, meanwhile, benefits from its wider feature list and use cases. There’s plenty of value in its free and lowest paid plan but most decent sized teams would want to go for the more expensive deals to get access to all of the features. It’s not necessarily a bad thing though – Airtable just knows that larger teams are more likely to need its comprehensive database and project management services, and charges accordingly. 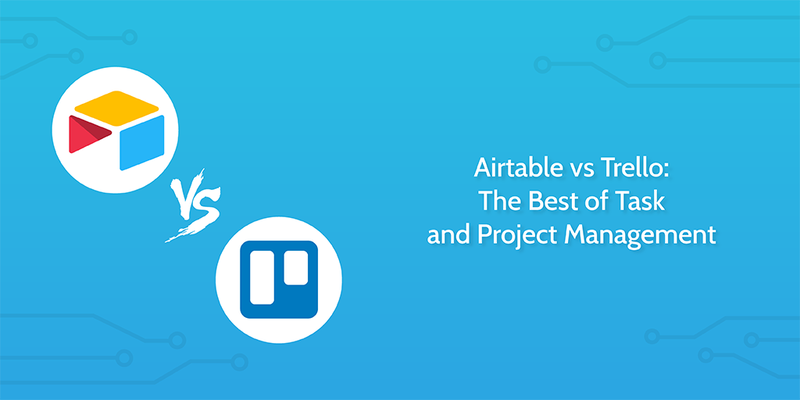 In a straight-up “which tool is more useful” fight of Airtable vs Trello, Airtable is the winner. It’s not limited to task management, can achieve a similar role to Trello using its Kanban board views, and can really help to organize and document every element necessary for a team to succeed. However, that doesn’t mean I’d recommend Airtable over Trello. It’s all about context. I’d be more inclined to confidently recommend Trello to anyone looking to organize their tasks and projects more efficiently. It’s much easier to get started with and less prone to small mistakes messing up your whole database. Depending on how you set up your Airtable account, your interlinked records can really suffer from unintentional mistakes. In short, if you’re looking for a tool to help you manage your efforts and get organized, give Trello a go. If you’ve already tried Trello or you’re a team which also needs a database to help store their data, Airtable is definitely worth your time – just be patient when getting to grips with it for the first time. Have you used Airtable or Trello? What did you think to them? I’d love to hear from you in the comments below! Ben Mulholland is an Editor at Process Street, and winds down with a casual article or two on Mulholland Writing. Find him on Twitter here. Great article that clearly & comprehensively outlines the similarities as well as the differences of the two. Super helpful for me as I presently use Trello but am searching for something that would also include a database/spreadsheet component for more of a CRM feel. Thx for this write-up, I really wanted to see an overview of comparison as I’ve been using both Airtable and Trello for a while now (Trello for about 3-4 years, Airtable for a year). What I miss is the main reason(s) why you guys changed to Airtable. You brought up the context topic. What was the context in your case that necessitated the switch to Airtable? I like Airtable but it has some serious limitations now: their iOS app is unusable (no copy-paste, no way to edit formulas, to name a few issues), no linking between bases (so you need to copy-paste infos from one base to another), no synch to google calendar, just my major issues. I’ve been using Trello and like it, but want to see how much more I can integrate into a common d-base. I’ll give airtable a whirl. After using airtable templates to create a few bases for various funtions in our startup I was shocked to find that “airtable doesn’t support linked files between bases”. Even with a zapier work around, I find it very strange that I would make an employee directory, and then not be able to link to it when those same employees start dividing up the work in a project tracker. Have you had to copy/paste a lot of info that will subsequently have to be manually updated? I suppose we use Airtable with a very limited number of bases. I, for example, only ever work out of one base. That base includes loads of tabs and each tab includes loads of views. So we have everything which would need to be connected connected as a result of it all being stored in a single base. You raise an interesting point though – perhaps Airtable would benefit from creating a special link for connecting files between multiple bases? I’m not sure what the security concerns would be – but for your use case it sounds like it would be useful. Some of our information gets passed into Airtable from other apps automatically via Zapier. So the information stored in the third party app is the main info and then what shows up in the Airtable base is kind of like an actionable copy of that data. With find and update style zaps built, the Airtable records can keep up to date with the main set of data in the third party app. Perhaps that would be a workaround? Have data from a third party populate multiple Airtable bases? My recommendation though would be to work with fewer bases and tailor the base to work at scale with all the info available. The bases are heavily customizable and can contain many different ways to display data in different views, so you can create multiple different user experiences or use cases within the same base, with a bit of set up time.